Oh, how we love the Harry Potter books. 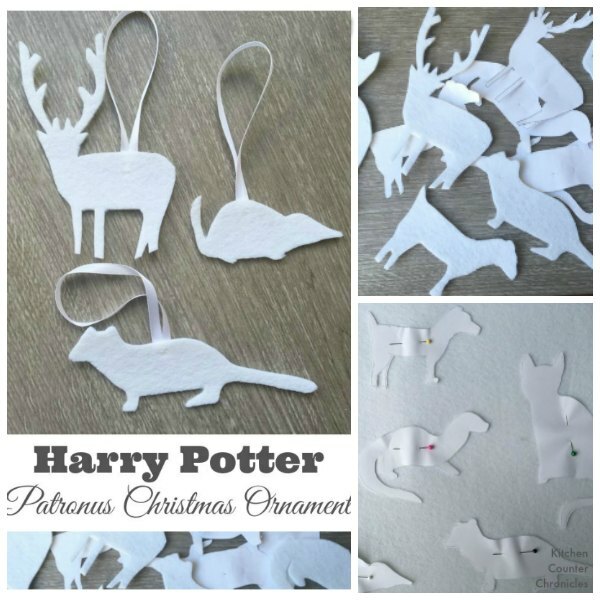 I have been thinking about making a Harry Potter themed Christmas ornament with my girls, for years now. We’ve bounced between the idea of making house flags, Weasley family Christmas sweaters and ornaments using pages of the actual books. Something about the beauty and the significance of the patronus pulled me in. I mean who doesn’t love when Snape reveals to Dumbledore that his patronus is Lily’s doe? He loves her, even after all this time. Chills. Did you know that you can find out what your patronus is on the Pottermore website. 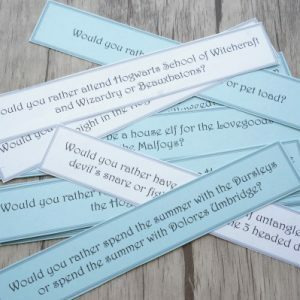 Yep, you can do a quick quiz and your patronus will be revealed, along with a description of why your particular patronus was chosen. Of course, the girls and I did the quiz. My patronus is a ocicat, my eldest daughter’s is a weasel and my youngest daughter’s is a shrew. Let’s just say my youngest was not happy about the shrew selection…oh well. 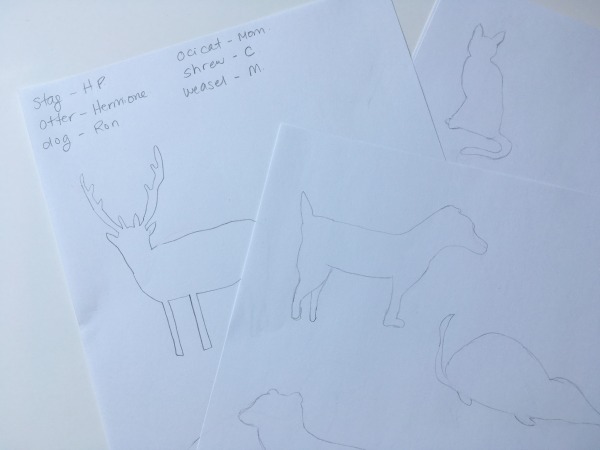 Once we had identified our patronus’ we knew what animals we would make. If you aren’t familiar with the patronus it is a protective “animal spirit” that an wizard can bring out when they are faced with a dementor. The patronus animal is significant as it is a reflection of the wizard’s personality – Harry’s patronus is a stag (like his father’s), Ron’s is a loyal jack Russell terrior and Hermione’s is an otter. Why an otter? Apparently, the otter is JK Rowling’s favourite animal and she has stated that Hermione is her favourite character, which is why she gave her a patronus of her favourite animal. 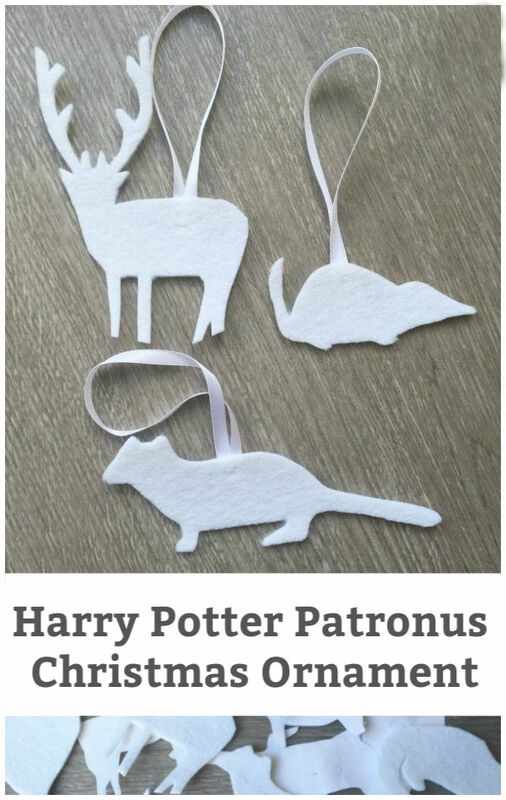 I had a feeling we could make lovely etherial patronus ornaments and they worked out beautifully. The first step is determining what your patronus is. Head to the Pottermore website and complete the patronus quiz. If you don’t have access to the site, don’t worry. Think about what your favourite animal is. What attributes do you love about your favourite animal? Is your favourite animal brave, strong, intelligent, comical or a combination of traits? Is your animal kinda like you? Do a little brainstorming and decide what your patronus is. Once you have determined what your patronus is, it’s time to do a little research. 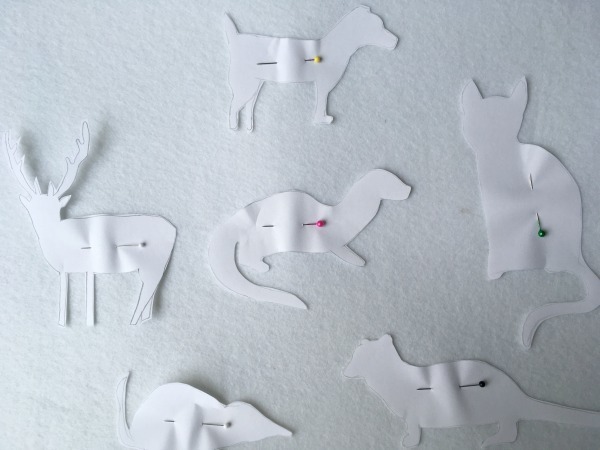 Search for your animal’s silhouette on your favourite search engine. Plenty of silhouette options will come up. I took inspiration from the free clipart animal silhouette’s. Pick the one you like…the easiest one for you to draw. Now you have two options. I drew mine free hand on a piece of paper. Alternately, you can print off a silhouette to use the printed version. 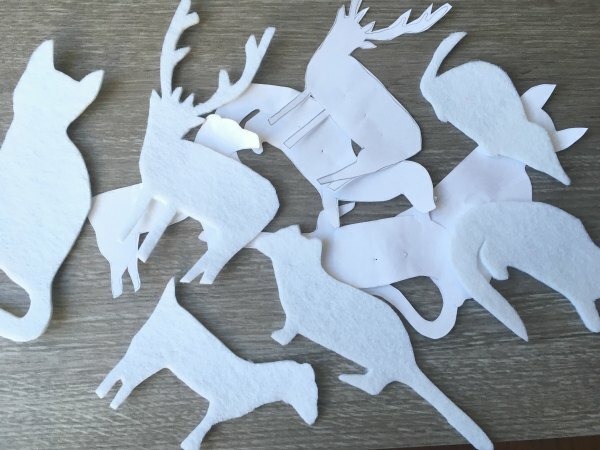 Once you have your patronus silhouette cut it out and pin it to the sheet of white felt. 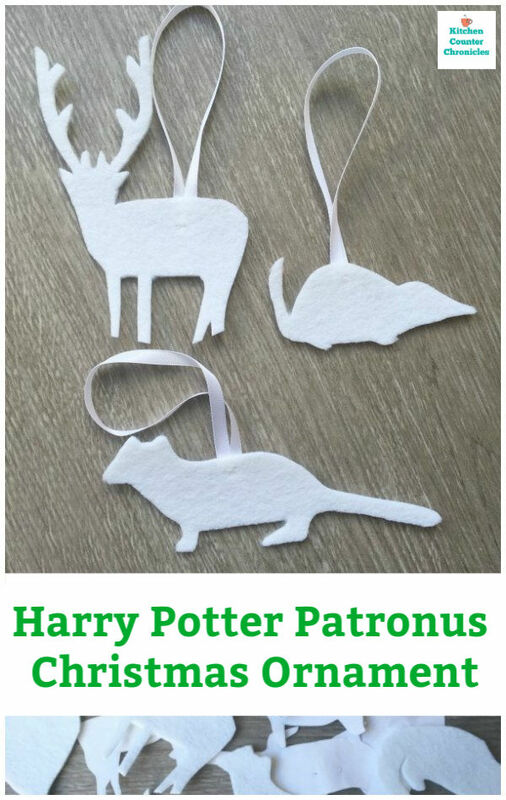 Use sharp scissors to cut out the patronus. My daughters were able to easily cut through the heavy felt. Because we used felt, we didn’t have to worry about sewing raw edges. 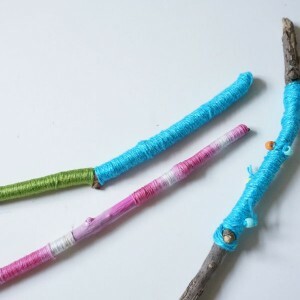 Cut a piece of ribbon that is large enough to use to hang the ornament from the tree. Sew a ribbon loop in place on what will be the back of the ornament. Done! 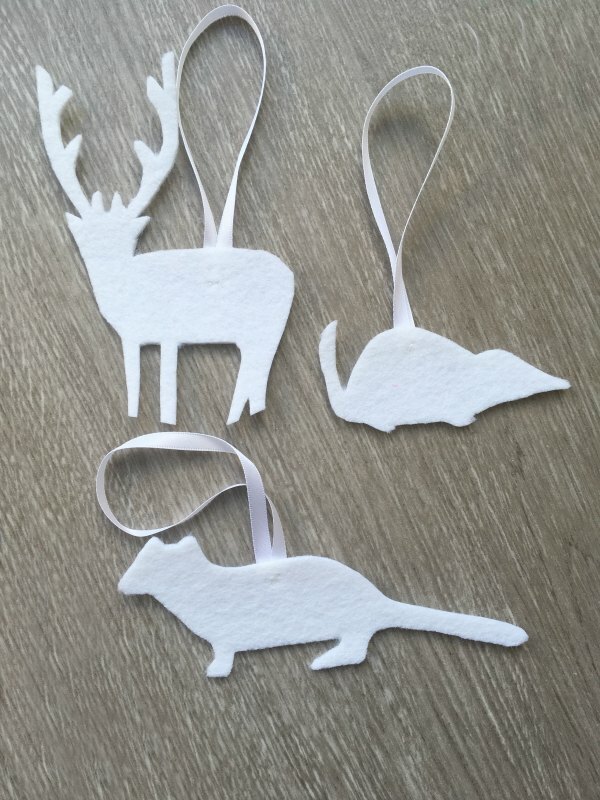 Hang up the ornaments. How cute are these? 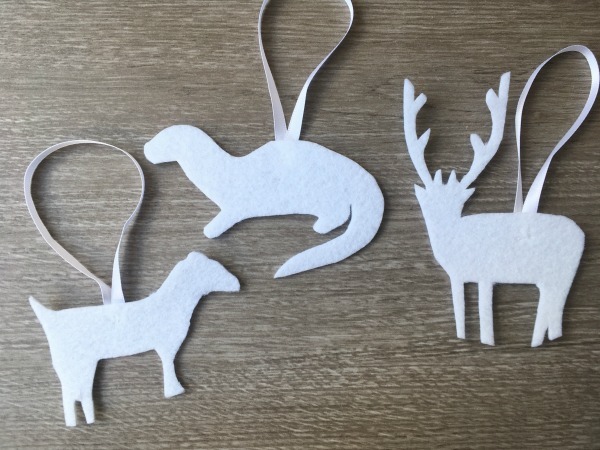 We even made Harry’s stag, Hermione’s otter and Ron’s dog. Our Christmas tree will be filled with the spirit of Harry Potter this holiday. 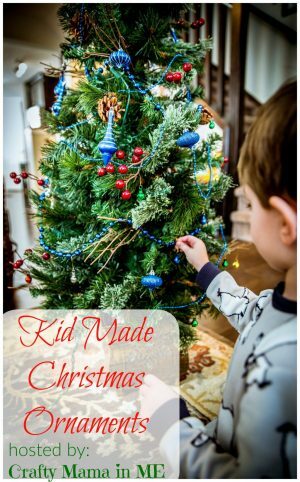 Looking for more inspiration then why not check out the Kid-Made Christmas Ornaments hosted by Crafty Mama In Me for more ideas to inspire you to get creative this Christmas. Thanks. Yes, it really is so much fun to read and watch with your kids…even though I loved Harry long before kids came along. Pinned! This is nice for Harry Potter fans and all children. Clever!